Sustainable intensification of the specialty crops industry and urban agriculture involves the application of modern technologies to improve profitability, environmental stewardship, and social wellbeing. To improve productivity of specialty crops, farmers in Missouri and throughout the country use intensive production systems such as black plastic mulch, floating row covers, low and high tunnels, and heated greenhouses to increase temperature and extend the production season of high value crops. Low tunnels are easy to assemble and disassemble with each crop, which offers an advantage over high tunnels of been readily movable, allowing for rotations with cover crops or other cash crops to maintain soil health and the system use efficiency. Here we discuss some of the benefits of low tunnels that can improve productivity and sustainability of the production system. 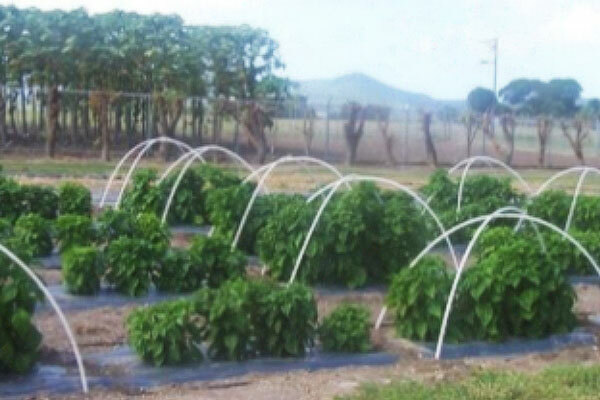 Low tunnels covered with spun-bonded row cover over wire hoops. Low tunnels are temporary structures comprised of a set of hoops (2 to 4ft tall) aligned over one or several rows and covered with a material that fits the purpose. The supporting hoops can be wire (No. 6 or 9), PVC, metal pipe, or other supporting material. Wire hoops are the most economical, but PVC and metal pipes work better for tall tunnels and windy conditions. 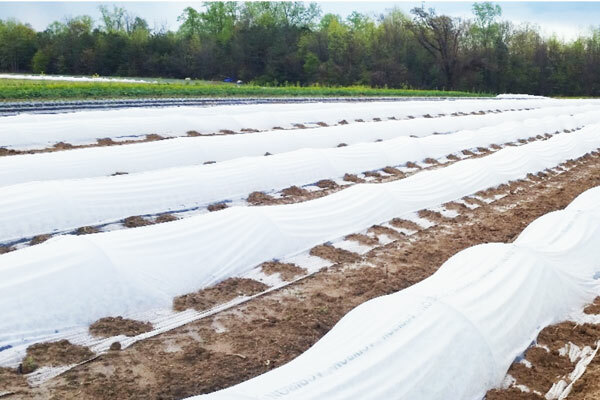 For season extension, low tunnels are covered with slit or perforated transparent polyethylene film and semitransparent spun-bonded plastic fabrics of various thicknesses. Spun-bonded fabrics are also used as floating blankets directly over the crop. The use of plastic films is limited as row cover because of water condensation in the inner side of the film, which results in suffocation and decay of the foliage in contact with the water. This problem is rare with spun-bonded fabrics because they are permeable and allow air flow with little condensation, which dissipates rapidly after sunrise. Spun-bonded fabrics are available in various thicknesses: 0.5 to 3 oz/yd2. The thickness influences the level of protection against cold temperatures and mild freezes/frosts, but the strength of the material depends on its thickness. Heavier fabrics are stronger and can maintain warmer temperatures under the tunnel in a freezing or near freezing event, but cost more. Lightweight fabrics are less expensive, but the level of protection against low temperatures is less and rip easily, so careful handling during installation and removal is necessary for reuse. Manufacturer specifications may indicate the expected temperature differences (2°F to 12°F) between the inside and outside the material can offer, but environmental conditions may also play a role in their performance. Tight and secured ends and sides are critical to avoid wind getting underneath and blow the cover away. Many farmers use sand or gravel bags, but shoveling soil makes a good tight closure as well. 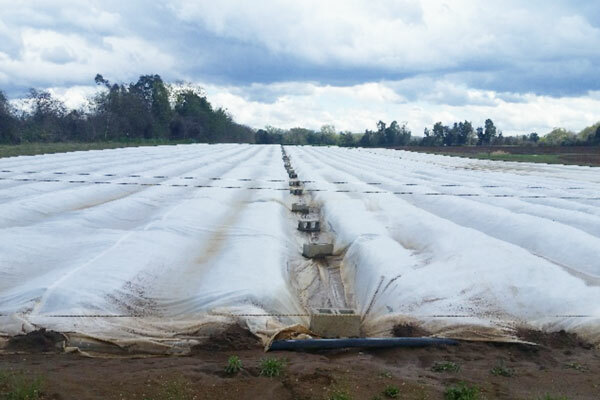 Row covers modify the microenvironment under the tunnel into more favorable growing conditions that reduce overall plant stress. Low tunnels effectively increase air and soil temperatures, protect crops against cold temperatures and mild freezes, and promote vegetative growth. 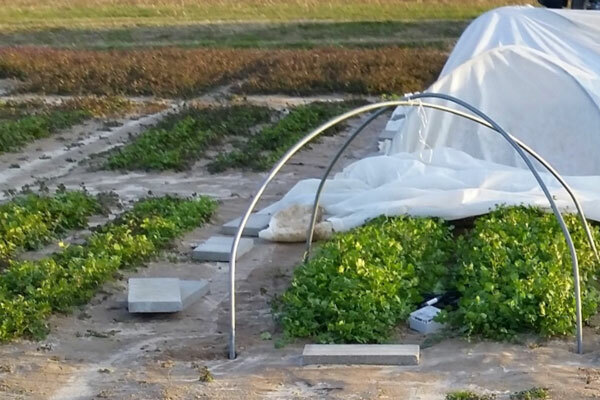 Studies with cucurbitaceous, solanaceous and other specialty crops throughout the country have shown that low tunnels covered with spun-bonded fabrics enhance vegetative growth, which it has been attributed to the increased temperature. Micro-environmental conditions indicate that in addition to the increased temperatures, the cover reduces light intensity and blocks wind resulting in less evapotranspiration (the sum of evaporation from the soil and evaporation from plants). This reduced water stress in the peak hours of sunny and/or windy days promotes vegetative growth resulting in larger plants, similar to growing in greenhouses. 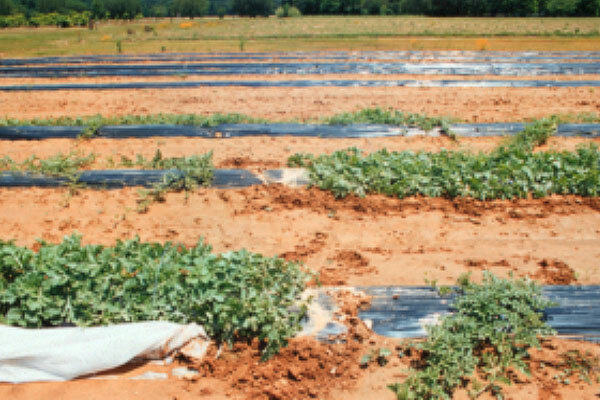 In the case of cucumber, peppers, and okra, the enhanced vegetative growth by the time of cover removal sustains more fruits and therefore, yield increases in comparison to open field. Timing for cover removal, however, is critical in crops that require insects for pollination such as cucurbits. In addition, the reduced evapotranspiration results in less water requirements, so irrigation is reduced under low tunnels despite the increased in temperature. Enhanced vegetative growth in spring watermelon under low tunnels covered with spun-bonded row cover over wire hoops. Cool season crops that can withstand freezing temperature also benefits when grown under low tunnels in early spring and late fall. In fact, farmers use low tunnels inside high tunnels as an additional protection layer against extreme cold temperatures in northern states to promote growth of cool season crops. The enhanced vegetative growth of leafy vegetables grown under low tunnels shorten the growth period between planting and harvest. In addition to early harvests, decreasing the time to harvest allows additional harvest events and/or crop cycles within the season, which may increase profitability and land use efficiency. Puerto Rican sweet pepper under low tunnels covered with spun-bonded row cover over PVC hoops for taller plants. Spun-bonded row covers and insect nets are physical barriers against insect pests as well as viral diseases transmitted by insects. Coarse insect nets (small mesh or large gaps) exclude large insects such as butterflies and moths, bugs, beetles, and others from reaching the crop and reduce feeding injury. However, most virus-transmitting insects are small. Aphids, whiteflies and thrips transmit the most common viruses affecting specialty crops. Row covers and fine insect nets of large mesh (small gaps) can effectively exclude small insects and reduce the direct feeding injury as well as the incidence of viral diseases transmitted by these vectors. Therefore, tunnels covered with spun-bonded fabrics and insect nets can reduce the use of insecticides, benefiting conventional as well as organic producers of specialty crops. Fall cilantro under low tunnels covered with spun-bonded row cover over metal hoops for wider beds and windy conditions. In conclusion, there are opportunities for specialty crops farmers and urban agriculture in Missouri to improve their operation sustainability by using low tunnels. Since low tunnels increase yield and profitability, and considering that low tunnels are more affordable than high tunnels in the short term, they can very well improve the economic sustainability of specialty crops farmers. Low tunnels reduce insecticide applications, which improves environmental sustainability. Low tunnels also reduce the time to harvest and increase crop cycles, so land and/or roof top use efficiency improves significantly, which is particularly important for small-sized specialty crops operations and urban agriculture.